Rachel Carson Middle School debate against The Dalton School during final round. NEW YORK - May 11, 2018 - PRLog -- Should reptiles be pets? Should the Olympics include video games? Should the US adopt a guaranteed minimum income level? These are just a few of the topics middle school students debated during the English in Action Middle School Debate Championship Tournament on May 5 in New York City. 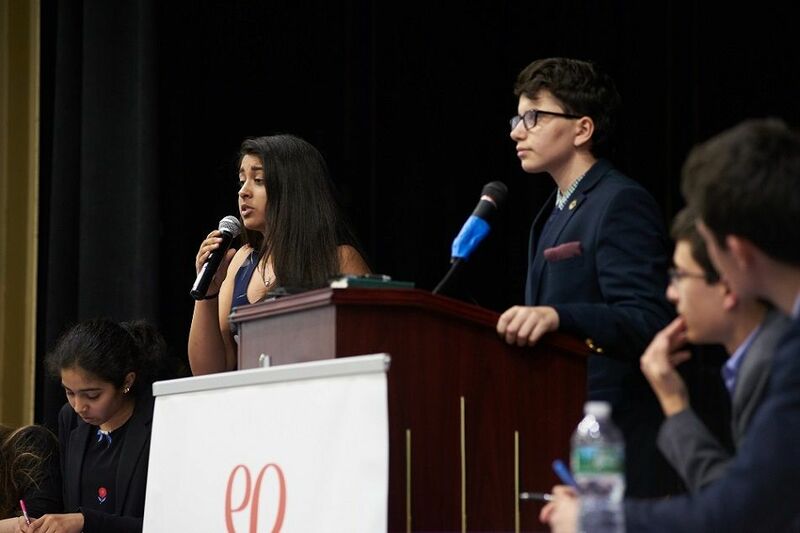 279 debaters from 33 schools from New York, New Jersey, Connecticut, Virginia, Maryland and Colorado converged at the Nest +m public school to participate in the seventh annual tournament. Rachel Carson Middle School from Herndon, Virginia won the final debate against The Dalton School from New York, New York. Taking home the Top Speaker and coveted Golden Gavel awards was Jasmine Sanchez of West End Secondary School in New York, NY for earning top individual speaker points across all five rounds of debate. Middle School Debate teaches the fundamentals of argumentation and debate to students in grades 5-8 while developing their critical thinking and language arts skills. More than 50 public, private, parochial and charter schools participate in the program, engaging more than 1,000 teenagers annually in weekly after-school debate activities. The English in Action Middle School Debate Program is a joint venture with Middle School Public Debate Program at Claremont McKenna College, the world's largest program for classroom and contest debating for middle school students. The English-Speaking Union, under the banner English in Action, is a non-profit educational charity that employs English as a catalyst to foster global understanding and good will through education and cultural exchange. Founded in 1920 the ESU is a national organization with more than 65 branches nationwide and affiliated with a network of more than 50 ESUs around the world. Our educational programs focus on teacher enrichment and immigrant support, international exchange and public speaking. For additional information, please visit https://www.esuus.org/esu/programs/middle_school_debate. Travel and Learn Abroad (TLab)provides teachers and lifelong learners educational enrichment programs at Oxford, the University of Edinburgh, Shakespeare's Globe and Shakespeare Birthplace Trust.